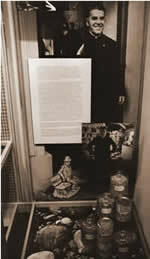 Father McDyer, the ‘can-do’ priest who dreamed up the Folk Village Museum to help stem the tide of emigration. James Mc Dyer was born in a small townland called Kilraine in Glenties, County Donegal in 1910. He was the youngest child of seven. The most indelible impression of his childhood and adolescence was the 'convoy' - a gathering of neighbours in the homes of those who were about to emigrate, in order to wish last farewells. Convoys were a constant feature of life in West Donegal during the second half of the nineteenth and the first part of the twentieth century. McDyer’s recall of the pathos and heartbreak of emigration remained with him all his life and inspired him to do all he could to give his parishioners reasons to stay. 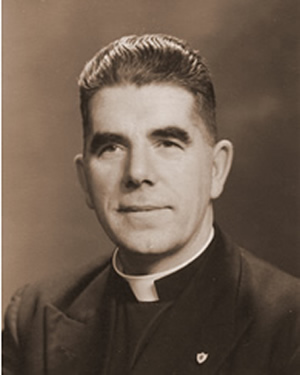 Father McDyer was educated at St Eunans College, Letterkenny, and entered Maynooth seminary in 1930. 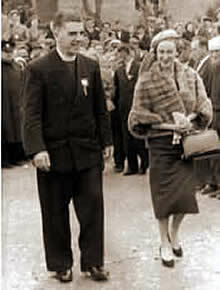 In 1937 he was ordained and went to Wandsworth in London, where he worked as a curate with Irish emigrants. The war years were spent in London and the South East of England. His descriptions of the conditions in London during the Blitz are harrowing in the extreme. He returned to Donegal in 1947 and was stationed on Tory Island, where he spent four and a half years before being transferred to Glencolmcille in December 1951. At this time Glencolmcille suffered from a lack of employment and, consequently, from emigration. During the seventy years before Fr McDyer’s arrival, the Parish lost some 60% of its population due to root problems of poor land, distance from any centre of population, and lack of industry. These were not new problems, having been present since the time of the Great Famine a hundred years previously. Father McDyer determined to do all he could to help break this cycle. He combined a shrewd intelligence with boundless enthusiasm and had an endless supply of ideas for new projects designed to boost services and employment. In 1953, due his efforts, a community centre was built in Glencolmcille. Very little money was available and the centre was built by voluntary labour. The first sod was turned in January and the work was completed 12 weeks later. He then turned his attention to the installation of electricity – forcefully putting his case and pulling what strings he could to have electrification completed quickly. The Folk Village Museum was built in three months in 1967. Formal planning permission to build it was only received the day after it was officially opened by Mr Childers, Minister for Transport and Tourism. 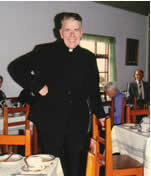 In 1986 Canon McDyer as he was then retired. His retirement was marked by presentations, speeches on a night of great joy, and sorrow, in the Glen Bay Hotel. In June 1987 he celebrated the Golden Jubilee of his ordination to the priesthood. This event was marked by a special mass in Carrick with Dr Hegarty, Bishop of Rahoe. On the 25 November 1987 Canon McDyer died quietly in his sleep. 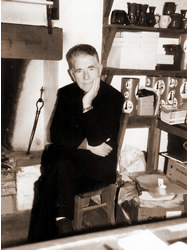 His enthusiastic, sometimes, unorthodox contribution to the Parish of Glencolmcille over thirty-five years can still be seen with projects like the Glencolmcille Folk Village Museum, the Errigal Fishing Factory and he continues to hold a special place in the memories of the people of Glencolmcille. Father McDyer had boundless enthusiasm and energy, a shrewd intelligence and an endless supply of ideas for solving the problems in the area. He undertook many projects within the Parish of Glencolmcille, amongst which was the Folk Village Museum. are available in the Craft Shop, Folk Village, Glencolmcille, County Donegal.